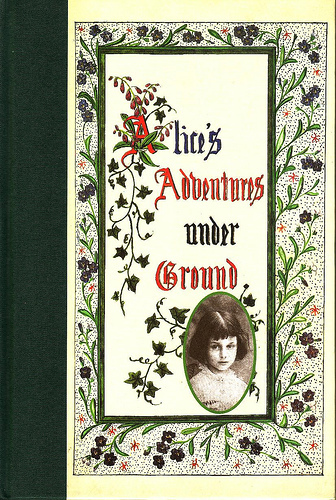 Facsimile edition of Dodgson’s manuscript hand written and illustrated for Alice Liddell and her sisters. I have two copies of this: one was given to me for my 21st birthday and the other was my father’s. It has his book-plate on the inside of the cover, and so is unbearably precious. You can read the book and see Dodgson’s pictures on the British Library site. 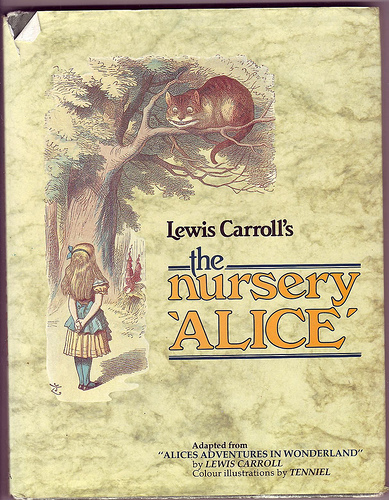 The Nursery Alice by Lewis Carroll. Illustrations by Tenniel. Published by Godfrey Cave Associates Ltd, 1985. Hardback first edition in this version: with dust jacket. 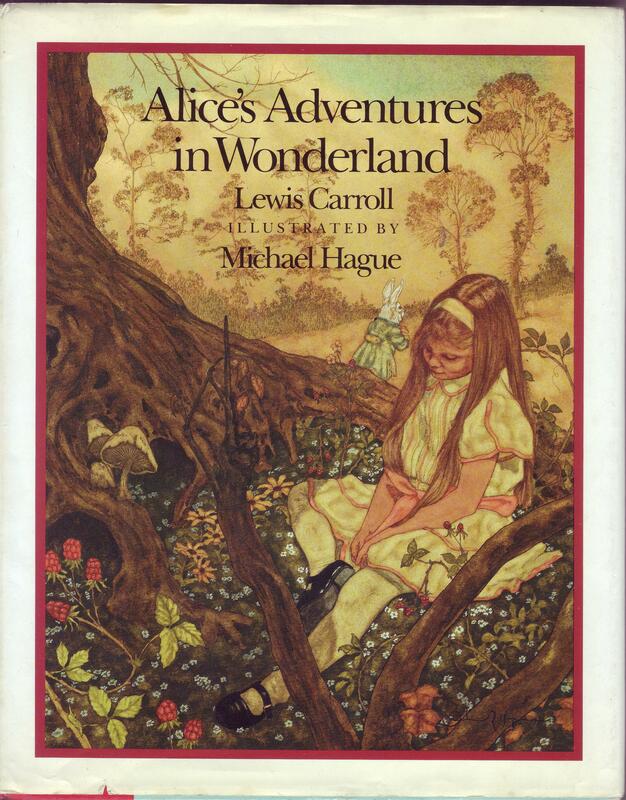 First published in 1890 by Macmillan, 25 years after the original Alice, this is a shortened and simplified version of the story, adapted for younger readers by Carroll himself. ONCE upon a time, there was a little girl called Alice: and she had a very curious dream. Would you like to hear what it was that she dreamed about ? Well, this was the first thing that happened. A White Rabbit came running by, in a great hurry; and, just as it passed Alice, it stopped, and took its watch out of its pocket. Wasn’t that a funny thing ? Did you ever see a Rabbit that had a watch, and a pocket to put it in ? Of course, when a Rabbit has a watch, it must have a pocket to put it in: it would never do to carry it about in its mouth—and it wants its hands sometimes, to run about with. Hasn’t it got pretty pink eyes (I think all White Rabbits have pink eyes); and pink ears; and a nice brown coat; and you can just see its red pocket-handkerchief peeping out of its coat pocket: and, what with its blue neck-tie and its yellow waistcoat, it really is very nicely dressed. 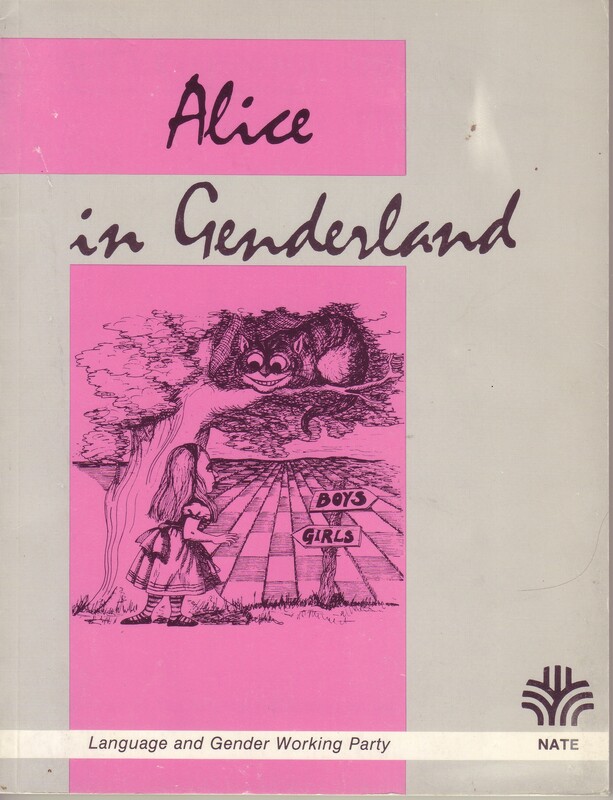 Alice in Genderland: Reflections on Language, Power and Control by various- the Language and Gender Working Party. Published 1985 by the National Association for the Teaching of English. A collection of articles with titles such as ” A Woman’s World”, Innocence and Experience: The Politics of Gender and Sexual Experience” and “Tampax and Flowers”, all prefixed with a suitable selection from the Alice books, and with a (rather good) parody of a Tenniel illustration.